The 3-in-1 Combo Mixer by Kalorik is the perfect marriage between function and design. Keep everything needed for quick food prep neatly organized and within reach thanks to this three -in-one combination stick mixer. The unit provides a handle with a decorative chrome panel for a secure grip and a long stainless steel shaft that reaches effortlessly into pots, pans, or mixing cups for blending purees, sauces, protein shakes, or smoothies. Best of all, the appliance converts from a stick mixer to a whisk with a simple twist for making homemade whipped cream or mayonnaise. It can also be attached to the included chopper for chopping up green peppers, onions, garlic, and more in seconds. The full mixing set with its entourage of accessories stores elegantly with the help of its convenient holder. General GEM120 18.9 L (19.9 qt.) Commercial Stand Mixer. General mixers are designed for heavy duty operation. The air cooled motor drives the sealed all gear, self lubricating transmission assuring a smooth running planetary system. Ideal for use in any food service facility requiring medium to heavy duty mixing; restaurants, bakeries, supermarkets, schools, universities, and more! Tough enough to handle bread, pastry, and pizza dough, batters, toppings and other food mixtures. General GEM130 28.3 L (29.9 qt.) Commercial Stand Mixer. General mixers are designed for heavy duty operation. The air cooled motor drives the sealed all gear, self lubricating transmission assuring a smooth running planetary system. Ideal for use in any food service facility requiring medium to heavy duty mixing; restaurants, bakeries, supermarkets, schools, universities, and more! Tough enough to handle bread, pastry, and pizza dough, batters, toppings and other food mixtures. The Kalorik Stick Mixer quickly purees, blends, and mixes batters, beverages, and more. The unit's stainless-steel blade provides extremely smooth and even blending, while its protective blade guard helps prevent splattering. The mixer offers one-handed operation with its lightweight design, easy-to-grip ergonomic handle, and simple push-button controls. In addition, its long shape reaches into pots, pitchers, and bowls for extended blending options, eliminating the need to dirty extra dishes. For quick clean-up, the blender's detachable shaft is dishwasher safe and the smooth surface of the blender body wipes clean with a damp cloth. A durable, plastic mixing cup with measuring marks is also included. This plunging mixer has a variable speed control, a turbo function and a powerful motor to adapt effortlessly to any mixing duty. Quickly puree soups, blend batters, mixebeverages, and more. The unit's stainless-steel blade provides extremely smooth and even blending, while its protective blade guard helps prevent splattering. The blender offers one-handed operation with its easy-to-grip ergonomic handle, and blue-lighted push-button controls. In addition, its long shape reaches into pots, pitchers, and bowls for extended blending options, eliminating the need to dirty extra dishes. For quick clean-up, the blender's detachable shaft can go in the dishwasher and the smooth and elegant stainless steel surface of the mixer's body wipes clean with a damp cloth. A durable plastic mixing cup with measuring marks up the side and a convenient handle is included. 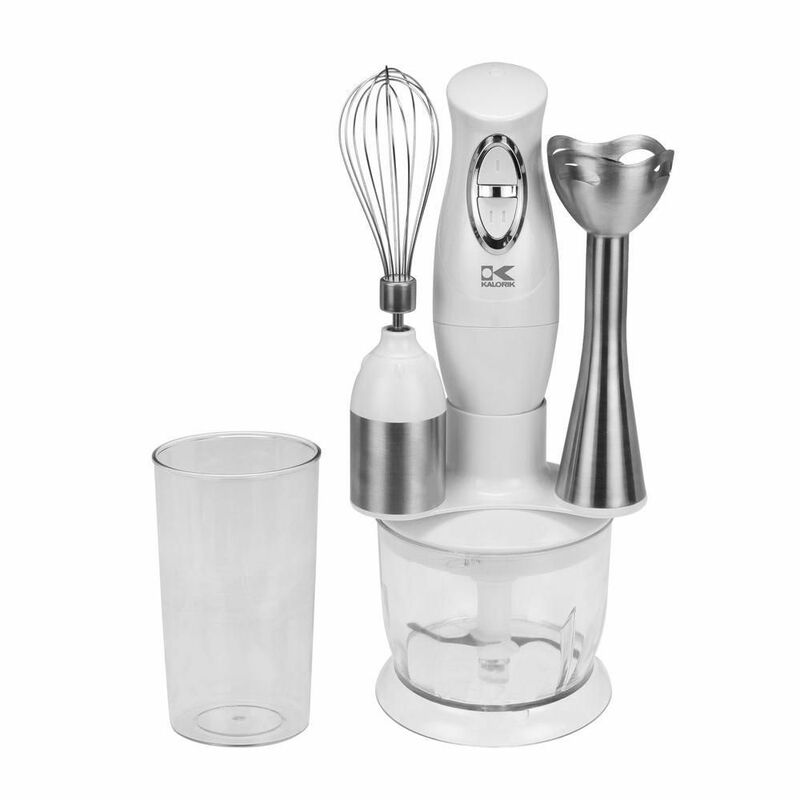 Combo Mixer in White with Including Mixing Cup, Chopper and Whisk The 3-in-1 Combo Mixer by Kalorik is the perfect marriage between function and design. Keep everything needed for quick food prep neatly organized and within reach thanks to this three -in-one combination stick mixer. The unit provides a handle with a decorative chrome panel for a secure grip and a long stainless steel shaft that reaches effortlessly into pots, pans, or mixing cups for blending purees, sauces, protein shakes, or smoothies. Best of all, the appliance converts from a stick mixer to a whisk with a simple twist for making homemade whipped cream or mayonnaise. It can also be attached to the included chopper for chopping up green peppers, onions, garlic, and more in seconds. The full mixing set with its entourage of accessories stores elegantly with the help of its convenient holder.